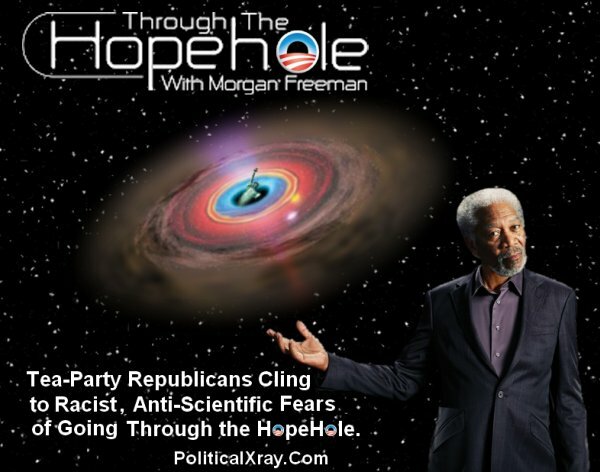 WEBCommentary(tm) - Through the Wormhole with Morgan Freeman for Obama in 2012 is Through the HopeHole a.k.a. the SuperMassive Sink-Hole of Obamageddon. Through the Wormhole with Morgan Freeman for Obama in 2012 is Through the HopeHole a.k.a. the SuperMassive Sink-Hole of Obamageddon. Self-proclaimed objectivist, Morgan Freeman, who ascribes anti-scientific and racist motives to those who oppose re-election of Barack Obama, provides the voice-over for an Obama Campaign commercial. 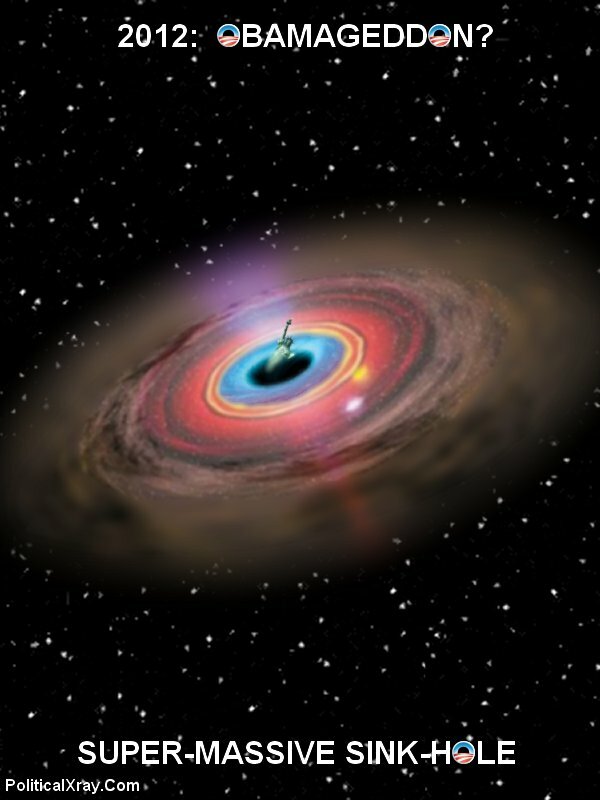 While the Super-Collider at CERN is seeking to find the "God" Particle (the Higgs Boson) to provide through-the-wormhole insights into the expansion of the Universe from a Big Bang, the November 6, 2012 Ideology-Collider in America is seeking insights into expansion of economic activity in the wake of the Big Collapse caused by the Fannie-Mae/Freddie-Mac Sub-Prime Redistribution. While the Super-Collider at CERN is seeking to find the "God" Particle (the Higgs Boson) to provide through-the-wormhole insights into the expansion of the Universe from a Big Bang, the November 6, 2012 Ideology-Collider in America is seeking insights into expansion of economic activity in the wake of the Big Collapse caused by the Fannie-Mae/Freddie-Mac Sub-Prime Redistribution. Freeman urges voters that recovery from the Big Collapse requires them to travel through the HopeHole and that only anti-scientific, racists could think the HopeHole will lead to the Big Crunch. Thus, Obama and Freeman want our Enterprise to proceed at flank speed into the HopeHole. In contrast, Mitt Romney and Paul Ryan seek to enable voters to understand that we are already perilously close to the Event Horizon such that continuing towards the HopeHole will take us across that event horizon and make the Big Crunch inevitable. As Captain Picard would say upon learning that the U.S. Enterprise is rapidly approaching such event horizon, Romney/Ryan say: "Full Reverse NOW." Are scientists able to predict political outcomes based on the fusion of quantum physics, politics, culture, astronomy and philosophy? 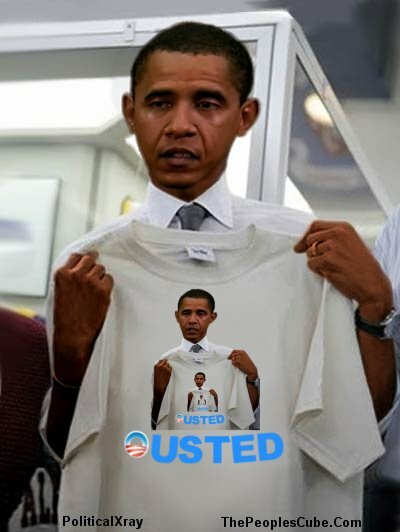 Scientists have just deciphered the the Mayan-Nostradamic-Revelations for 2012: Obamageddon Super-Massive Sink-Hole.